Freelance writing jobs online are exactly how I got my start as a remote worker. Quick story: After years of struggling in the corporate world, I decided to quit my full-time job to go freelance. I had never written professionally before and I had no idea where to start. But I was determined. And I used that determination to launch a freelance writing career from scratch. The first year was tough. Some days, I wanted to quit. But I never gave up. And, by the year’s end, I was earning more income as a freelance writer than I ever did as a corporate cubicle dweller. The best part? I was working on my own terms. I decided how much I worked, at what times, and for whom. Sound appealing? You’re in luck! There are plenty of freelance writing jobs online you can go after, even if you’re a beginner. If I can do it, so can you! Not all freelance writing jobs are created equal. Some writing gigs pay per word. Others are paid by piece or project. Sometimes, you’ll write for an agency that supplies you with work. You can also strike out on your own and find clients via networking or marketplace sites. There is no right or wrong way to establish yourself as a freelance writer. What works for you won’t work for others and vice versa. Content mills supply bulk writing projects to large clients. For example, a global Ecommerce shop might turn to a content mill to write product descriptions for the hundreds and thousands of items they sell on their website. The content mill then turns around and farms the content writing out to a pool of freelance writers. Often, these writing jobs are uploaded to a database and are claimed on a first come, first served basis. There is no guarantee that work will be available to you at any given time. To become a paid freelance writer at a content mill you typically have to pass a writing test. Don’t worry. The test is not difficult and is only used to determine your skill level as a writer. In some cases, the stronger your test writing piece, the higher your pay rate. Speaking of pay, content mills don’t pay the best. Writers often earn a penny or less per word. This can make it difficult to earn a full-time wage as a content mill writer. However, I turned to a popular content mill called Textbroker when I first started freelance writing. Although the pay was low, the experience and confidence gained were invaluable. I like to think of my time as a freelance writer for a content mill as a paid writing internship. Even if you’re not sure about writing for content mills, I encourage you to check out a few! Read up on some of the popular ones and decide for yoruself whether it’s worth it. Remember, no two freelance writers earn a living the same way. Freelance writers receive a rating based on their writing sample. You can work on different projects and earn more the higher your rating. Work ranges from short articles to more in-depth research pieces.Pay varies based on skill rating from 0.7 to 5 cents per word. You have to submit a writing sample and be accepted to write for Crowd Content. How much you earn depends on your rating level and the content you’re working on. For example, Crowd Content offers some writers up to 7.6 cents per word for custom content. As an added bonus, writers with high-quality work and fast turnaround times are often rewarded with extra pay. A writing sample is a must before joining the BKA Content team. If invited to write for them, you get to pick and choose the projects you work on. Options range from SEO articles to product descriptions. Writers are paid between 1.3 and 5 cents per word. Freelance marketplaces are the middlemen between clients and freelancers. On these sites, clients post gigs they need help with and freelancers pitch them their services. Clients award the gig to the freelancer they feel is best suited to the job. The marketplace site provides the platform for clients and freelancers to communicate, exchange work, and submit payment. Typically, the freelancer pays a percentage of their earnings to the marketplace. I enjoyed my time as a freelance writer for Upwork, the largest freelance marketplace site there is. It felt like a step up from writing for content mills since I got a chance to pitch my writing services directly to clients. Granted, I didn’t get every job I pitched to but I was earning far more per project than I was with Textbroker. As a bonus, pitching regularly on Upwork helped my confidence grow as a writer. Upwork reduces fees the more you earn with a single client. This encourages freelancers to establish long-term relationships with clients. You bid on client-posted projects on Freelancer. Projects can have an all-in fixed price or be paid hourly. Freelancer will take 10% of your earnings when you accept hourly gigs. Fixed-price projects also incur a 10% fee or a minimum of $5 — whichever is greater. You have the chance to earn more on Freelancer by joining their Preferred Freelancers program. On average, Preferred Freelancers earn $1,000 more in their first six months than their non-preferred peers! Before you start working on projects as a freelance writer on Guru, you have to come to an arrangement with your client. An arrangement sets out how you’ll be paid and when. Arrangements can be by milestone, by hour, by project, or recurring. Every time you complete a job, Guru will charge you a fee. Fees vary from 4.95% to 8.95%. There are a lot of niche job boards out there. For example, you can find remote-friendly jobs on my work from home jobs page. But, there are also job boards that specifically cater to certain fields or career, like freelance writing jobs. By browsing these niche job board sites for freelance writers, you can read ads posted by clients looking for writers. When you find something that interests you, you send over your pitch to detail why you’re the person for the job. Of course, you won’t get every gig you pitch to. And the amount of pay will run the gamut from pennies per word to thousands of dollars per project. Gigs can also be recurring or a one-time article. I turned to freelance writing job boards once I gained confidence and pitching practice from freelance marketplace sites. I also set up a freelance writer’s website to serve as a portfolio. When you get there, a freelance service site can do wonders for your career. It showcases your talents and shows social proof in one convenient location. Contena is a membership job search site. With your paid membership, you get access to thousands of paid writing gigs. There are also valuable resources to help you launch and grow your freelance writing career via the Contena Academy. FlexJobs is another membership-based niche job board that is dedicated to freelance, remote, and flexible job options. While not all jobs posted are for freelance writers, there are plenty of fresh leads here that you simply won’t find anywhere else. Plus, it’s affordable. I recommend freelancers sign up for a yearly membership. The cost comes out to less than $5 a month! You can save even more when you use this link and promo code AFFPROMO to sign up. ProBlogger is a 100% free job board for freelance writing jobs online. You can find everything from blogging gigs to editing jobs. While ProBlogger doesn’t have as many job as Contena or FlexJobs, it is still a valuable (free) resource to find freelance writing jobs. It’s nice to have the option of finding ready-to-hire freelance writing jobs via content mills, freelance marketplaces, and job boards. However, you can also take it upon yourself to find new clients and gigs via networking. Yes, it takes a little bit of virtual leg work to find your own clients, but it’s often worth it. The money you can earn finding your own clients is often much higher than what is found on various sourced-for-you-sites. Plus, networking is free! If you know you want to find your own clients but aren’t sure how to go about it — don’t panic. There are online learning resources that’ll help. Gina Horkey knows what she’s talking about when it comes to building a freelance biz from scratch. And that’s why she created Horkey Handbook — to help others grow their own freelance writing career as a beginner. 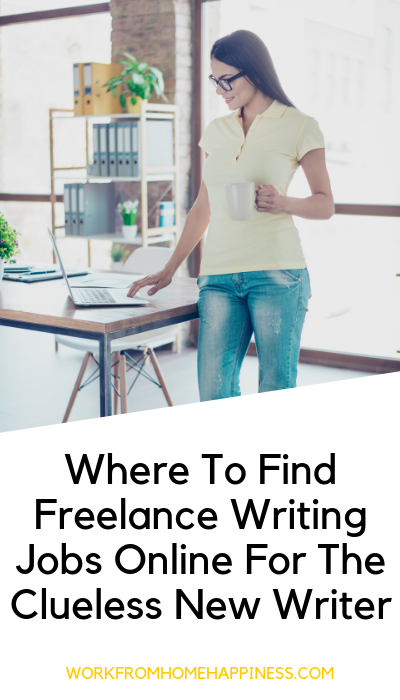 She created an amazing and comprehensive blog post you need to check out called how to become a paid freelance writer. Use it as a guide to help you go from thinking about freelancing to actually getting paid writing clients fast. There you have it — the different ways you can find freelance writing jobs online, even if you’re just starting out. Remember, there is no set way to become a paid freelance writer. You may find one path that works for you and others that don’t. And that’s okay. What is important is you get out there and take steps to actually launch a freelance writing career. You’ve got this! P.S. This post contains affiliate links. Please check out my disclosure statement for more information.